As you might have noticed, we have been very busy here at Web-Est with the launch of PDR-Software. This is something we are real excited about. Web-Est entered into an agreement with Community Data Group to begin selling this useful tool and the response has been great. I wanted to take some time to explore what it can do and how we think it benefits your business. 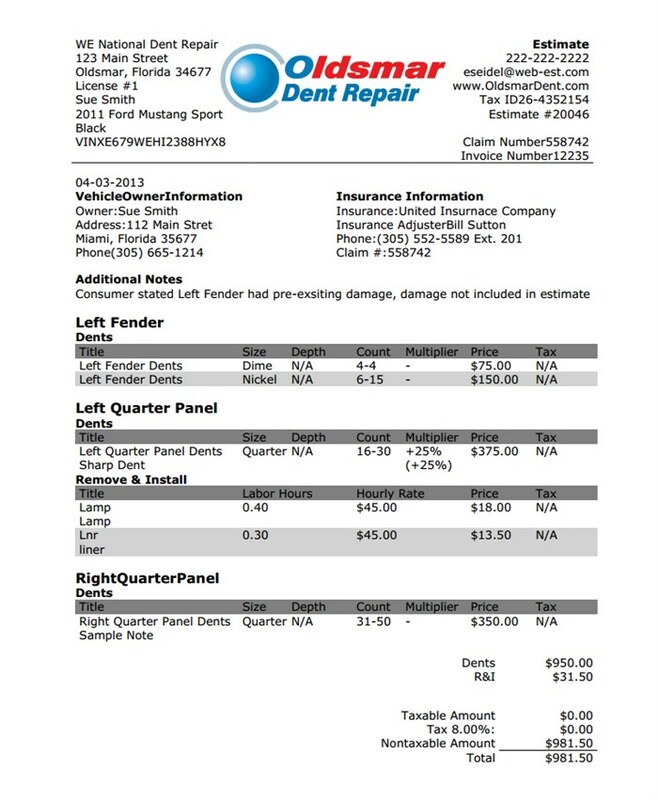 PDR-Software is a paintless dent repair estimating program created specifically for PDR repair professionals. By integrating paintless dent repair estimatics with logic-based technology, up-to-date OEM parts price data and additional parts R&I times, PDR-Software allows techs to write accurate estimates for their customers by efficiently using our Internet-based platform. Additionally, since PDR-Software is a web-based program, its compatible with all mobile technology. So if you are out on the road respond to a hail claim or traditional PDR claim, you conveniently pull out your IPadTM, IPhoneTM or AndroidTM device and begin writing your estimate using our point-and-click functionality. When you are finished, simply email the estimate to your customer and move on to the next assignment. Writing an estimate on PDR-Software is simple. After you enter the vehicle information, you can view the estimating matrix and enter in the number of dents by size, quantity, depth and even allow for special circumstances (oversized dents, contour lines, aluminum parts etc) simply by clicking on the appropriate selection. All of your selections calculate at the bottom in a table. Once complete, you can generate a professional estimate with your company information on it. Other key features that tech find helpful are easily accessible OEM part pricing. These prices appear on the left-hand side of each part category. You will also see a combined labor amount for traditional replacement of the part listed. A tech can look at these two figures and get a very good idea on cost of traditional repair on the panel versus PDR on the panel. Another unique feature is the labor rate setting. Estimators have two options for setting their labor rates. Techs can establish their own rates by creating a rate matrix as they would normally do. Techs also have the ability to use Community Data rates. The community data rates are averages based on other users in a given repair area or catastrophe location. This helps a tech coming in from a different location know what the average repair rates are for that location and gives him the ability to step right into the situation knowing his repair rates are in line with other techs in the area. PDR-Software was established to satisfy a need in the PDR community. Many techs that we have spoken to have been writing estimates on pre-made spreadsheets for years. The long-standing dilemma is the additional labor times and costs associated with the repair beyond the actual "popping" of a dent. Our program provides that information in an easily accessible and reliable format. It enables PDR professionals everywhere the ability to work efficiently and at a fraction of the cost of the more expensive software or traditional collision repair estimatics. With a starting cost as low as $39.00 per month, PDR-Software is the best program in the market. Simply put, PDR-Software was developed by PDR professionals for PDR professionals. You can start a no commitment, 14-day free trial by visiting PDR-Software.com. Web-Est has a free 14-day trial available for all users? Click here to start your free trial today.